In this delightfully charming teen spin on You’ve Got Mail, the one guy Bailey Rydell can’t stand is actually the boy of her dreams—she just doesn’t know it yet. 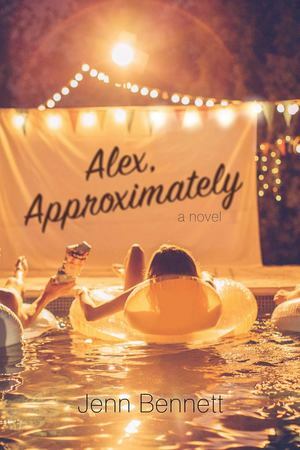 Classic movie buff Bailey “Mink” Rydell has spent months crushing on a witty film geek she only knows online by “Alex.” Two coasts separate the teens until Bailey moves in with her dad, who lives in the same California surfing town as her online crush. Faced with doubts (what if he’s a creep in real life—or worse? ), Bailey doesn’t tell Alex she’s moved to his hometown. Or that she’s landed a job at the local tourist-trap museum. Or that she’s being heckled daily by the irritatingly hot museum security guard, Porter Roth—a.k.a. her new arch-nemesis. But life is whole lot messier than the movies, especially when Bailey discovers that tricky fine line between hate, love, and whatever-it-is she’s starting to feel for Porter. And as the summer months go by, Bailey must choose whether to cling to a dreamy online fantasy in Alex or take a risk on an imperfect reality with Porter. The choice is both simpler and more complicated than she realizes, because Porter Roth is hiding a secret of his own: Porter is Alex…Approximately. Bailey Rhydell, nicknamed Mink, has been chatting and crushing on a boy online who goes by the name Alex. They share the same love for classic movies But she lives in Washington, D.C. with her mom and he lives in California, in the same small town as her father. And when she decides to move in with her dad this summer she's not sure if she should tell Alex, because she doesn't know for sure that he isn't some creep. When she gets a job at the local museum and meets Porter Roth, her arch nemesis and the security guard at the museum, they argue and banter constantly but she may start to have feelings for him, and she's not sure what she should do about Alex. So I would stay spoiler but honestly, if you read the synopsis on Goodreads, it's not a spoiler because they tell you that Porter is Alex. But of course, you don't need to even read the synopsis to figure that out. As soon as you start reading, it's so obvious and everyone can figure it out except for Bailey. While I really enjoyed this book, I just thought it was WAY to obvious. I'm not sure if it's suppose to be that way or not. I was just so frustrated with Bailey for not figuring it out. Other than that frustration, I really enjoyed this book. It was cute and lovable. Porter is such a great character and the banter between him and Bailey is quite cute in my opinion. It came across as flirting rather than arguing and I think that their relationship works well. This book definitely made me with that I was in California living off the beach just eating churros and fish tacos every day. But alas, I cannot. So I live vicariously through the book. I love that we got a girl friendship between Bailey and Grace and Bailey really learns to value that friendship and open up more. I really dislike when girls hate each other for no reason so it was good that I didn't have to read about that in this book. This was the perfect book for me to read right now because I was wanting a cute summer contemporary and that's what I got. Despite the issues with it, I recommend it!